Image Size: 21 X 32 in. 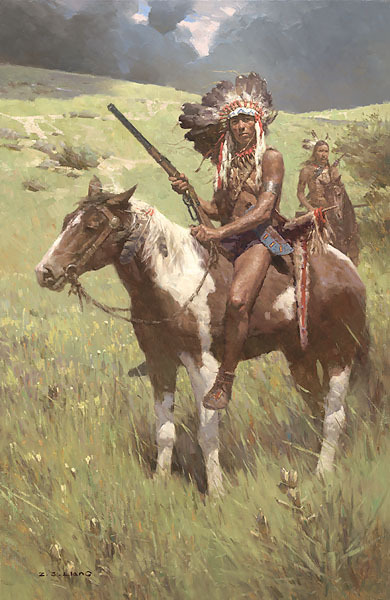 Early afternoon, June 25, 1876, Montana Territory, two scouts from the Sioux Encampment sight the Seventh Cavalry, led by General George Armstrong Custer, approaching from the East. The infamous Battle of the Little Bighorn is about to begin. Known to Native Americans as the Battle of Greasy Grass Creek, the conflict between a combined group of Lakota and Northern Cheyenne (led by great leaders such as Chief Sitting Bull and Crazy Horse) against Custer’s cavalry was a stunning defeat for the U.S. Army. Much has been made of Custer’s possible hubris in actions that led up to the battle, but the stark fact remains that these Native American warriors fought in a far superior fashion than had been expected. Also known as “Custer’s Last Stand,” the battle represented the high water mark of the Indian alliance and the call for retribution on the part of the U.S. citizenry was answered swiftly and harshly.